Google recently released Android 8.1 for the compatible Nexus and Pixel devices. Following the streak, the tech giant has now released Oreo for Android Wear. In October, Google introduced Oreo beta program for LG Watch Sport, and now it has become the first smartwatch to get the update. A Google developer advocate in the Android Wear community on Google+ says that the “Android Oreo roll out to Android Wear is starting today.” But, “Timing is determined by each watch’s manufacturer.” So, yeah, it means that ultimately OEMs will be responsible for rolling out the update for their wearables. As for Google, it has done its part by releasing the update. Coming to the new features and changes that come to Android Wear with Oreo update, we don’t see any significant redesigns here, but some of the tools have been enhanced, resulting in better optimization. 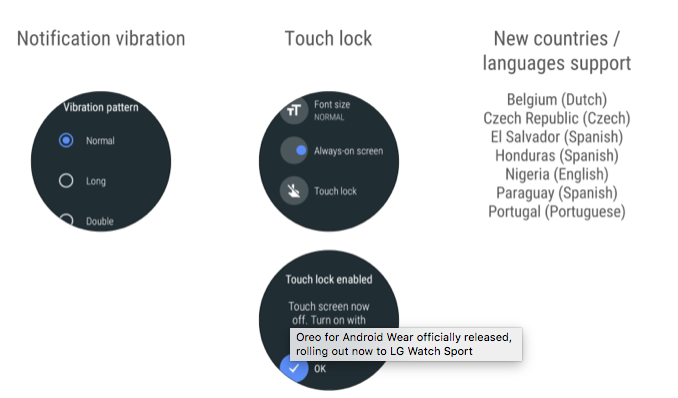 Alongside, Google has brought in a new option to disable touch-to-wake named “Touch lock” in Settings. Google touts that this option will come handy in moist conditions. Moreover, Google has also added the ability to manage the power of vibrations for notifications. Named as the “Vibration pattern,” it includes the options such as Normal, Long, and Double. Also, there is a now a new toggle that lets users manually enable the “Battery saver,” with this, users can turn on the power saver mode whenever they want instead of waiting for the device to reach low charge. The “Battery saver,” mode disables features that use power, such as location services, Wi-Fi & mobile usage, Data & app updates, Always-on display, and vibrations. Battery saver mode paired with Oreo’s background limits will result in better battery life on the device. Besides, Oreo update also brings notification channels for apps that will aid better management of app by users. Google also stated that Android Wear is now available in seven new countries and languages – Belgium (Dutch), Czech Republic (Czech), El Salvador (Spanish), Honduras (Spanish), Nigeria (English), Paraguay (Spanish), and Portugal (Portuguese). For now, the update is limited to LG Watch Sport. We may soon see other smartwatches getting it.